Sixty years ago, a Catholic priest named Father William Wasson rescued a starving street orphan from a Mexican jail after he’d stolen money from the alms box at Fr. Wasson’s Church to buy food. This humble missionary priest didn’t know it at the time, but his simple gesture of love would soon become Nuestros Pequenos Hermanos (Our Little Brothers and Sisters), a Catholic foundation that today operates nine orphanages throughout Central and South America. I recently returned from their Honduras orphanage, which is home to nearly 500 children. Most of us, when we think of an orphanage, conjure images from a Charles Dickens novel or a Bing Crosby movie — children born into loving homes, in good health, whose parents died too young. But in Honduras and elsewhere, the reality is very different. Many of the children who come to this orphanage were abandoned by parents who themselves are scarred by drug use and prostitution, and among these children are several with severe physical and mental disabilities. Virtually every child arrives with deep emotional wounds. They have suffered in ways that only a fellow orphan can understand. Often times while serving, our Mission Doctors run into a case where havinga specialist’s opinion would be very helpful. For a family practice physician providing care for a young patient with a rare skin condition, an e-mail from a dermatologist made all the difference. 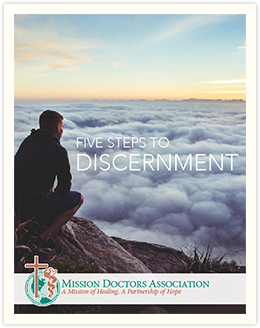 We are working to establish a cadre of physicians in various specialties willing to act as consultants to physicians on mission via e-mail, telephone or video conference. If you are interested in serving in this important way from your home, sign up to receive questions from our dedicated short and long-term mission doctors. Thank you to those who have already signed up, your time is greatly appreciated. Your expertise can save a life and provide support to Mission Doctors in the field. Contact Elise Frederick, efrederick@missiondoctors.org, to be part of this team of home physicians. Your support made a World of Difference. honored with the 2018 Msgr. Anthony Brouwers Award for their faith-filled service. Attendees enjoyed fine food, drinks, dancing and amazing city views all while supporting Mission Doctors. Did you miss this year’s ‘Heart for the World’ Gala? Next year is our 60th Anniversary, you won’t want to miss this celebration! Mark your calendars now – February 23, 2019. If you made it to the City Club, we shared a slide show of the night on our website. Click here and see if your photo made it! Doctors and their spouses considering short-term service are invited to attend a Retreat/Seminar at Loyola University Stritch School of Medicine in Chicago. Take the time to reflect on God’s call to ‘heal the sick’ and discuss the practical issues of medical licenses, visas, and international health insurance. Visit the MDA website for more information. In recognition of the dedicated work of Catholic Health Care Professionals, the Archdiocese of Los Angeles and Mission Doctors Association invites all Catholic medical professionals to the celebration of a White Mass at Cathedral of Our Lady of the Angels. Visit www.CatholicWM.org for more details. Click here to see more upcoming events.